Fortress is a special place. Walk into Fortress on any afternoon and you will see smiles, laughter and love. More than ever before, Fortress is equipping urban children with hope. The once-fledgling inner-city ministry is different now. The facilities are bigger and safer, the number of volunteers is larger, and through its expanded programs, Fortress is now not just loving children, but nurturing families as well. God is honored in this place. This is why my family supports Fortress. The compassionate staff works tirelessly to raise funds to conduct the work at Fortress. Let’s make their job a little easier this year. Join me in a year-end effort to raise $40,000 by December 31. I will get us halfway there with $20,000 and call on you to match the rest. It will be the best gift you give this Christmas. The Historic Southside neighborhood is bounded by I-35 to the west, Riverside Drive to the east, Vickery Street to the north, and Rosedale Street to the south. (Data Source: 2010 Census). 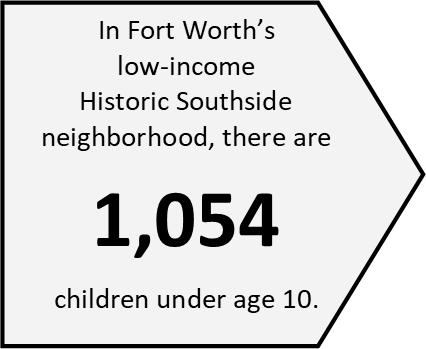 Fortress also serves children and families who reside in the Butler Place housing projects just north of I-30. A mere thirty percent of VZG students score “proficient” in reading versus 44% statewide. For math, VZG has 42% proficient (47% statewide) and for science, 32% (41% statewide). However, VZG is given a high score of 8/10 for student progress, indicating positive movement toward higher achievement. (Data source: www.greatschools.org). This includes all children enrolled from January-December 2018. (Data source: Procare Enrollment Database). 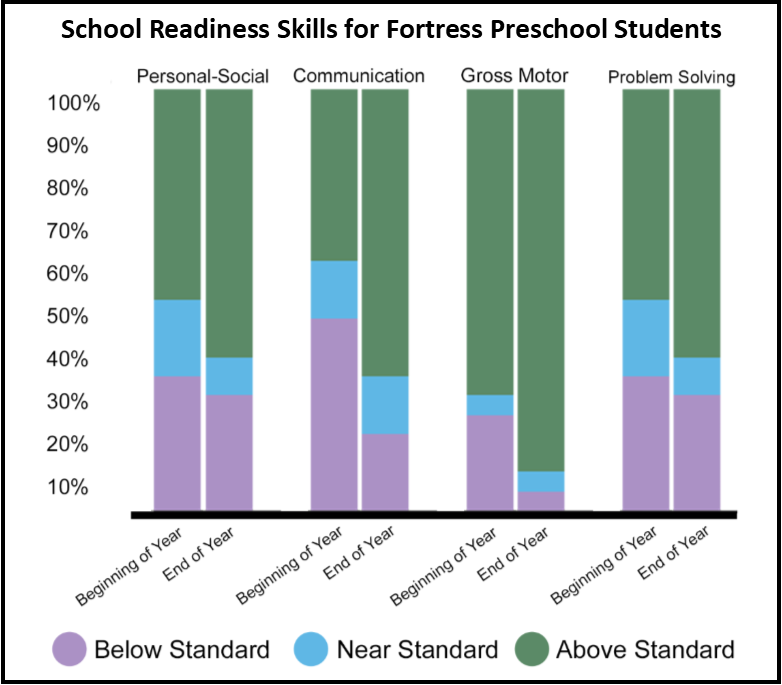 Our 3-5 year olds are measured on three essential social-emotional skills, while our 5-11 year olds are measured on eight essential social-emotional skills. We’re proud that so many of our student meet or exceed expectations in their skills, and are grateful for the opportunity to work with kids who need a little extra care. (Data source: 2018 DECA & DESSA assessments). All volunteers who work with in our programs go through a rigorous application and screening process to ensure the safety of our children. In addition to program volunteers, we work with small and large groups for special projects and events. 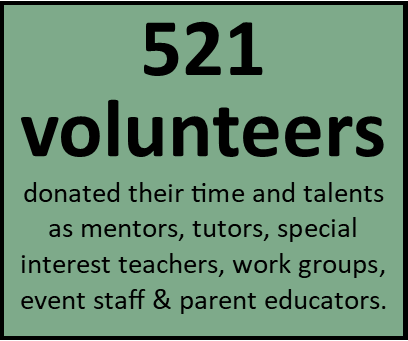 (Data source: 2018 volunteer logs). 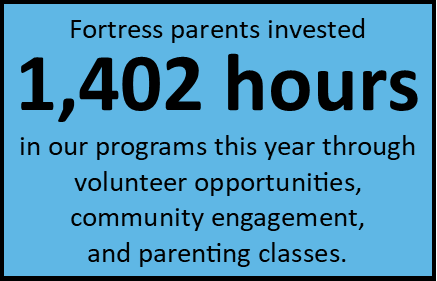 90% of our parents met or exceeded the requirement of investing 12 hours into our program. (Data source: 2017-18, 2018-19 Parent Hour Data). This year, the average family invested 21.5 hours through Equip, our parent engagement program. We’re proud that over half of the parenting hours were completed through parenting classes. Interestingly, 100% of the few Fortress students reading below grade level at the end of their 3rd grade year had been enrolled in our programs for less than 12 months. (Data source: 2013-2016 DST:R assessments of 3rd grade students). Reading on grade level by the end of 3rd grade dramatically increases a child’s chance on graduating high school on time! Research from the National Education Association and other education authorities tell us that early education is essential to later school success, especially for low-income learners. Those findings are reflected in our own data, especially our 3rd grade reading metrics. (Data source: Procare Enrollment Database). That’s an average of 2.5 years per child. (Data source: Procare Enrollment Database). We value the longevity of our relationships with our families and students and believe that is what makes our programs so successful. The ASQ measures competency of five primary functions (personal-social, communication, gross motor, fine motor, and problem solving) according to developmentally appropriate milestones for the child's age at the time of testing. (Data source: 2017-18 ASQ — Ages & Stages Questionnaire for all enrolled preschool students). (Data source: 2018-19 family survey data). The federal poverty line for a family of four is $25,100. 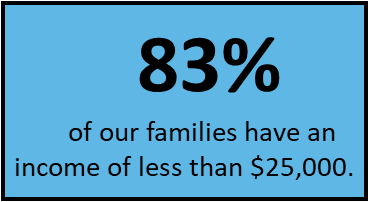 (Data source: 2018-19 family survey data). Remember: Your gift to Fortress is doubled through December 31!